Stream anime episodes for free, you want to Watch Fairy Tail Episode 54 English Subbed online for free. Episode guide Fairy Tail Episode 54 English Subbed Maiden of the Sky Wendy is captured by the Oración Seis, and so is Happy! Erza is poisoned, and the poison is spreading through her body, which will eventually lead to her death. Erza requests for her arm to be cut off, but Charle says that Wendy can save her. 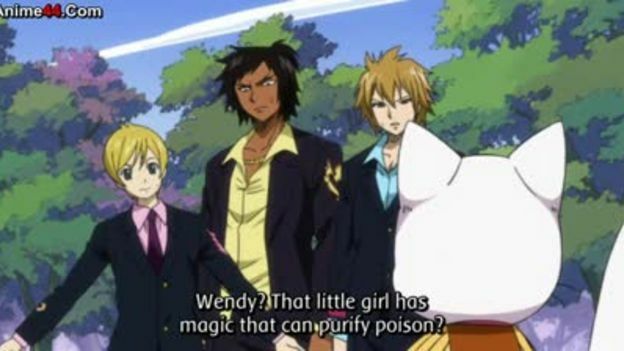 Turns out, Wendy is the Sky Dragon Slayer, who has healing powers. The representatives intend to save Wendy and Happy, in order to be able to heal Erza. Oracion Seis intend to use Wendy’s healing power to resurrect a certain person. Lucy stays behind with Hibiki to take care of Erza, while the others set off to rescue Happy and Wendy. On the way, Natsu, Gray and Charles are surrounded by Naked Mummy, who is working for the Oracion Seis, and have to defeat them. Wendy is ordered to revive a certain person, and that person is … Jellal!